Building Management System | Real Time Solutions Pvt. Ltd. Operational and energy efficiency is a must for every building. 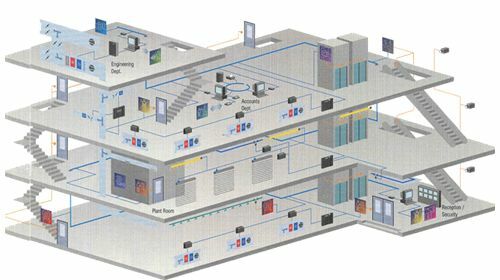 Building management system is a computer based control system installed in the buildings that controls and monitors the building’s mechanical and electrical equipment such as ventilation, lighting, power systems, fire systems and many more. Building management system now has become a major agenda for energy efficiency. The purpose of BMS is to control, monitor and optimize building services, like lighting; heating; security, CCTV and fire alarm systems; access control; audio-visual and entertainment systems; ventilation, filtration and climate control, etc and even time & attendance control and reporting (notably staff movement and availability). BMS are computer based and are generally focused in optimized use of the building resources. Optimized use of building resources here implies to cost effectiveness that can be obtained from various operational activities. For example, with the application of Building management system, managers and the concerned people would be able to automatically switch on and off the operation of devices like generators, transformers, switch gears to UPS and so on.